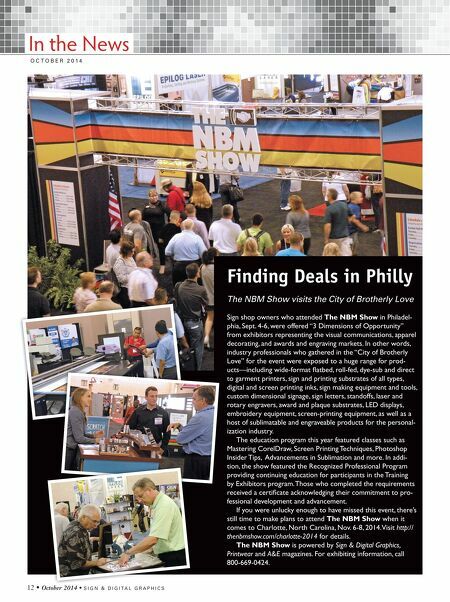 12 • October 2014 • S I G N & D I G I T A L G R A P H I C S O C T O B E R 2 0 1 4 In the News Finding Deals in Philly The NBM Show visits the City of Brotherly Love Sign shop owners who attended The NBM Show in Philadel- phia, Sept. 4-6, were offered "3 Dimensions of Opportunity" from exhibitors representing the visual communications, apparel decorating, and awards and engraving markets. In other words, industry professionals who gathered in the "City of Brotherly Love" for the event were exposed to a huge range for prod- ucts—including wide-format flatbed, roll-fed, dye-sub and direct to garment printers, sign and printing substrates of all types, digital and screen printing inks, sign making equipment and tools, custom dimensional signage, sign letters, standoffs, laser and rotary engravers, award and plaque substrates, LED displays, embroidery equipment, screen-printing equipment, as well as a host of sublimatable and engraveable products for the personal- ization industry. The education program this year featured classes such as Mastering CorelDraw, Screen Printing Techniques, Photoshop Insider Tips, Advancements in Sublimation and more. In addi- tion, the show featured the Recognized Professional Program providing continuing education for participants in the Training by Exhibitors program. Those who completed the requirements received a certificate acknowledging their commitment to pro- fessional development and advancement. If you were unlucky enough to have missed this event, there's still time to make plans to attend The NBM Show when it comes to Charlotte, North Carolina, Nov. 6-8, 2014. Visit http:// thenbmshow.com/charlotte-2014 for details. The NBM Show is powered by Sign & Digital Graphics, Printwear and A&E magazines. 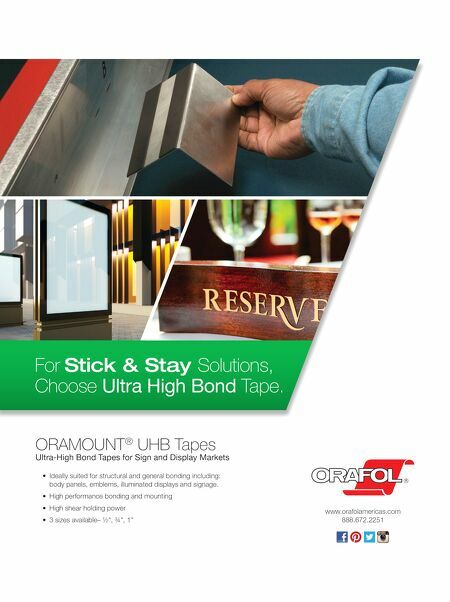 For exhibiting information, call 800-669-0424.